It’s been created in response to the current scandal surrounding Facebook which has seen many users ditch the social media platform. In the most damaging controversy to ever hit Facebook it has been accused of allowing another company to harvest personal data to influence the last U.S. election. O-oh! Valentine’s Day is almost upon us. You might love it. You might dread it. Either way, it elicits a response. 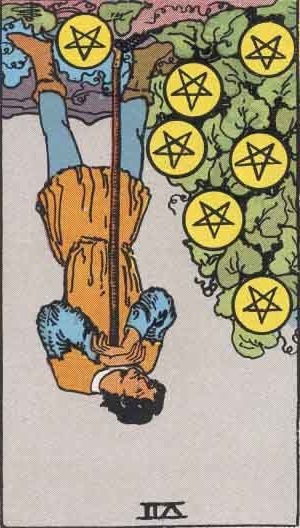 Seven Of Pentacles Reversed: What’s The Point In Trying? The scene portrayed in this card looks kind of unreal. Like a dream. There’s all those golden colours for a start. And the lead characters are unusual. Can you see how small they look compared to the cups? And what is that funny hat the boy is wearing? They put me in mind of the Little People of myth and legend. Either that or they’re children. The castle guard and thatched cottage in the background only adds to the whole fairytale feel. This card whisks you back to the past, back to childhood.